Hello, friends, today, in my warm house in Springfield, MO which has covered by the snow, I would like to introduce a little part of a poem Yin Zhong Ba Xian�CLi Baiby one of the greatest poets in Chinese history --Du Fu. Du Fu 杜甫 dù fǔ (712-770) was born in today's Henan province during the Tang Dynasty (618-907). He is one of the greatest poets in Chinese history. Du Fu had a very good home education; he began composing poetry when he was 5 and started to learn Chinese calligraphy when he was 9. He communicated with adults through poetry from the age of 15 to16. In his first travels in Wu and Yue -- today's Zhejiang and Jiangsu provinces, he knew about another equally great poet of Tang Dynasty -- Li Bai. At this time, he was about 20 years old and his poems were very positive and full of dreams. When Du Fu was 22 years old, he failed in the imperial examinations but he stayed in the capital Chang'an city -- Today's Xi'an for about 10 years, living a very poor life. This kind of experience and life gave him some opportunities to learn much about the life of common people. His poetry entered in a new and realistic period. As a follower of Confucian philosophy, Du Fu cared for the future and fate of the country and he wished to have an opportunity to work for the country. However, he did not become an officer until he was 44 years old. In 755, the Rebellion of An and Shi led the country into a civil war that lasted for about 8 years. During this time, Du Fu became a fugitive and he experienced a harder and poorer life, while his poetry reached its highest peak. In 770, when he was 58 years old and on his way back his hometown, Du Fu died on a boat. Du Fu experienced the decline of the Tang Dynasty from its most prosperous times and his poems reflect the whole of the process, so that people said his poetry was "Poetry of Historic Significance” in its content. At the same time, he also developed traditional Chinese poetry in its forms and he could write almost all kinds of Chinese poetry excellently. Du Fu's poetry has had a great influence on poets for about 1,200 years, down to the present day. There are about 1,400 of his poems still in existence. Sleeping at a pub of a Changan's market. The Emperor called (him), (he) refused on board. "I am an immortal in the wine." This poem was created in about 746, when Du Fu just arrived in Changan (today’s Xian). It is said that Li Bai, He Zhizhang, Li Shizhi, Li Jin, Cui Zongjin, Su Jin, Zhang Xu and Jiao Sui were eight talent poets, calligraphy or officers who had lived or worked in Changan. Because all of them they have something similar, such as have free and open-minds, bold and uninhibited characters, especially enjoying drinking and could created something wonderful after a drinking. Therefore, they were called “Eight Immortals in the Drinking ”in Changan at that time. Therefore, Du Fu used the word "Drinking" to connect the 8 talents and created “a collective portrait” for them. Since it is a long poem for the eight people, here, I would just choose a little part which is written about Li Bai. Li Bai (701-762) is one of the greatest poets in China. He was born in Chengji --it is near today's Gansu province (the other version said it is today’s Tianshui in Gansu ). When he was 5 years old, he was taken to Sichuan by his father. Li Bai was influenced by both Confucianism and Taoism. He started to travel in the country when he was 25 years old. He entered the imperial court and became a member of the Han-lin Academy at the age of 42. He was greatly delighted and eager to serve the emperor like a capable statesman. But the Emperor Xuanzong only had him as a wonderful palace poet to write trivial lyrics. He was unwilling to serve such a meaningless function, so he left from the capital in less than two years, to start his second travel aimlessly wandering all over the country. Then he was charged with an adherent of the rebel and sentenced to exile, though he was pardoned on the way. He died of illness at Dangtu in today's Anhui . Li Bai lived in the most flourishing times in the Tang Dynasty (618 - 907). Most of his poems reflected a positive times spirit. He is considered as the foremost romantic poet in the Tang Dynasty and his writing style has been affecting the following poets until now. About 1,100 poems by Li Bai have been existing from his times. They are very popular and many of them have been recited by Chinese children. Now let see how Du Fu wrote about Li Bai on his this character of drinking. 李白斗酒（一斗）诗百篇 LǐBái dǒujǐu shī bǎi piān Li Bai can write 100 poems after drinking a deciliter of wine. 斗 a unit of dry measure for grain (=1 deciliter), 斗酒jǐu means wine or alcoholic drinking; 诗shī, means poem, 百 bǎi, means a hundred, hundred, 篇 piān, means a piece of writing, sheet of paper etc . This line means Li Bai is so talent, so that he can write a hundred poems after drinking a deciliter of wine. First time, this poem points out the relationship among drinking, poetry and Li Bai. He is talent, but he needs to drink, then he can write. We can see the first feature image of Li Bai. The second line 长安市上酒家眠 Chángān shìshàng jǐujiā mián.长安 Chángān, place name, it is today’s Xian; 市上shìshàng, means in the market. 市shì means market; 酒家jǐujiā means wine shop, pub, or restaurant which can also sell wine; 眠 mián, means sleep. This line means that Li Bai often sleep at a pub of a Changan's market after a drinking. Here the second time mention the relationship between Li Bai and drinking. We have seen the second image of Li Bai who is sleeping maybe anywhere he just drunk. The third line 天子呼来不上船 Tiānzǐ hūlái bú shàngchuān. 天子 Tiānzǐ means emperor ; 呼hū means call ； 来lái means come; 不 bú / bù means no, not; 上船 shàngchuān, means board, boarding, on board; 船chuān, means ship, boat. This line means when he was drinking, even though the Emperor called him (coming), he refused on board. 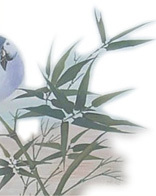 Here, we have see the third image of Li Bai. The last line: 自称臣是酒中仙 zīchēng chēn shì jǐu zhōng xiān. 自称 zīchēng means call himself, 臣 chēn means official under a feudal ruler, I, my; 是shì means is, are, am; 酒中仙 jǐu shénxiān means immortal in the win. 中zhōng, means, center, middle, in; 仙xiān, means immortal. This line means he called himself an immortal in the wine or "I am an immortal in the wine. " Now we have seen the 4 th image of Li Bai. Now let us recall what we have seen in the short 4 lines. A talent who can create 100 poems as soon as he drinks, a free poet who can sleep anywhere after he drinking, a behave unbridledly citizen who was not afraid of the right of an emperor when he was drinking and a lovely “immortal ” in the wine. Until now, we cannot help admire what a wonderful poet of Du Fu for his wonderful writing style, just used the little 28 Chinese characters, he has “painted out” one or 4 wonderful figures of Bi Bai. This kind of writing style, just like Chinese painting’s Baimiao with only Chinese ink , does not use any decorate words, but just “writes” with a simple and clean language. 1.Li Bai's poetry was flowed from his heart naturally, instead of squeezing out of his mind hard. Therefore, it is natural and just like a lotus flower just rose from under (the) water. 2.Li Bai is a creature of the age, the creature of the Glorious Age of the Tang Dynasty. Just because he lived in the strongest and the most glorious age in Chinese history, he could be so free and so easy to express himself no matter his dream or his individual characters even though he was facing an emperor. No matter a nation or a country, as long as they want to flourish their arts, they must firstly create an relaxed and free social environment for artists. A strong economy is the foundation to create the wonderful environment. If you have any questions, comments and suggestions, please let me know by writing to shirley@ebridge.cn . You are also welcome to publish your opinions in Message Board as well.